When you graduate into adulthood and begin trying to manage your finances, the first step you’ll often be encouraged to take is to create a budget. While that’s important, there’s something else even more basic and more important you should explore. Here’s the secret: the budget isn’t any good unless you track your spending. If numbers and spreadsheets make your head spin, you’re probably cringing at the thought of tracking your spending. Yes, there are certainly hundreds of ways to do this and yes, you’ll need to do a little math. But instead of focusing on the how, let’s talk about the why. If you’re willing to recognize the benefits of tracking your spending, you’re more likely to do it (math and all). Here are seven benefits of tracking your spending to get you motivated to start. In order to create a meaningful budget, you need to understand a little bit about where your money goes. You probably know how much your rent or mortgage is. It’s a budget category that shouldn’t fluctuate too much. But how about your grocery bill? How about gas for your car? Many areas of your budget will fluctuate weekly, monthly, or seasonally. If you only look at your last grocery receipt, you might overlook the fact you purchased extra food because of house guests, or that you bought less food because you stayed with your parents for a few days. If you didn’t have to fill up on gas this week, you might forget to include that in your budget. It’s important to track your spending for a longer term in order to build a better budget. And when you build a better budget, you’re more likely to stick to it. Track your grocery bill for a few weeks (or months). Pull up all your utility bills for the last year. Tracking your spending for a while before creating your budget means you’ll have an excellent starting point for your spending plan. You already know where your money is going – you’re just documenting it in the budget. From there, you can decide what changes you need to make. Speaking of changes you need to make, you’ve probably heard one of those sob stories – the kind where someone making six figures a year is broke. How does that even happen? It’s because they spent, spent, spent, and never had a plan for where the money was really needed. That’s why having a budget is so important, but it’s not enough. If you’re spending way off plan, you’ll find yourself in the hole every month. On the other hand, if you track your spending – even without a budget – you might uncover a few shocking numbers. Did you think you were spending $100 a week on groceries, only to realize the figure was more like $300? Did you assume you spent $500 a year on clothes, only to see that you spent that amount each month? Or maybe you mindlessly spend money at the vending machines at work. That might not seem like a problem until you tally up the expense and realize what else you could have done with the money. Tracking your spending puts your expenses in black and white. There’s no denying your problem areas anymore. Knowing is half the battle. Similarly, you might have known good and well that you spend $300 per month on groceries, but as you compare your spending to your budget, you might realize some areas need to be trimmed. You might also decide the excess money you’re spending is better off going toward debt or savings. Likewise, seeing a large electric bill will make you more likely to shut off lights when you leave the room (just like your mom always said to do). A large water bill might make you question your 30 minute showers. You’ll likely continue along with your daily routine until you see the impact it has on your wallet. Finances are one of the biggest causes of stress and tension in long-term relationships. That’s more likely to be the case when neither party has any idea what the other party is doing with their money. The very act of tracking spending together as a couple makes it more likely that you’ll coordinate with your partner ahead of purchases. However, it also closes the loop after purchases have been made. You can check to make sure all your expenditures align with the priorities you have as a team. For example, let’s look at a marriage where the wife normally buys groceries. She plans that her husband will pack leftovers for work lunches, but some days he doesn’t really love the meal, and other days there isn’t enough food left over to make a full lunch. He decides to buy lunch at the work cafeteria. Unfortunately, that doesn’t align with their overall priority for debt payoff. Tracking their spending means they can have a discussion about this in order to make a better plan for the future. Side note: it’s good to have a way to buy each other gifts (even if they are small) without having to recap them in an expense-tracking meeting! When you’re tracking your spending, don’t just add up all the receipts you have. Go back through your bank accounts and make sure you capture everything. Many people will find there are a few charges they forgot about (ahem, iTunes anyone?). These charges are often subscriptions you signed up for a long time ago, and you might not have used the service in years. People are especially prone to signing up for a “free” service that’s actually only free for a few months. Then it begins to charge you. You probably told yourself you would cancel the subscription before the charges kicked in, but then forgot. As you run through these charges, promptly cancel all subscriptions you no longer need or want. For the remainder of the charges, make sure they find a place in your budget. Are you in debt payoff mode? Are you saving for a house down payment or retirement? No matter who you are or how old you are, you likely have some long-term financial goals. The ultimate goal of your budget is to make those long-term goals happen. However, your spending puts the pedal to the metal. You budget means nothing unless you abide by it. Let’s say you’re in debt payoff mode and you’ve budgeted $300 a month for it. However, each month you find you’re short of making that happen because you spent too much money on entertainment or eating out. 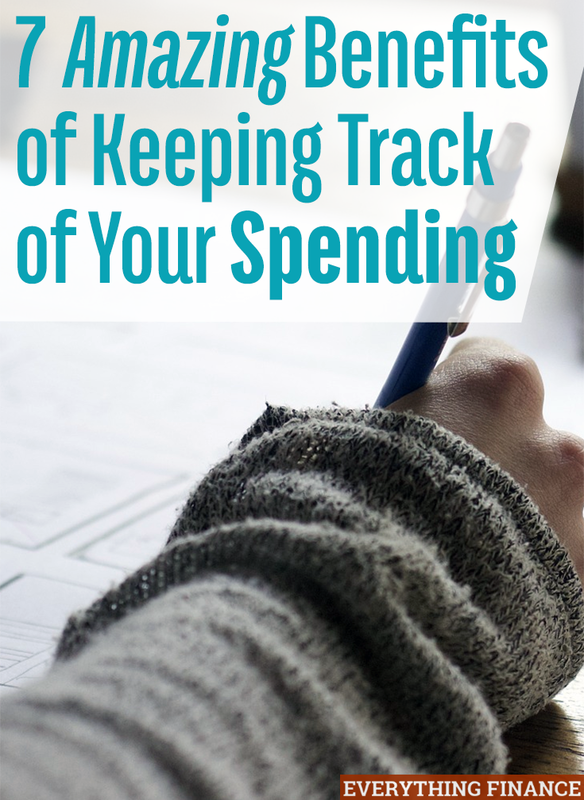 Tracking your spending allows you to start questioning yourself. Are these expenses really in line with your priorities? One special note here: you are allowed to change your priorities. Debt payoff might be your priority today, but tomorrow it could be different. Make sure you know what your top priorities are by reviewing them monthly. Don’t allow your spending to control them. Let’s say you decide to track your spending. You pull together all your receipts. You arm yourself with a glass of wine to tackle the mountain of receipts before you. The first month, you have 75 receipts to examine, plus additional charges in your bank statement you had forgotten about (oops). You stopped in the grocery store more than once each week. You had three different Amazon orders. You paid daycare each week. You got gas several times – not because you had to, but because you didn’t really plan your trips well. As you move forward, you might find you want to simply your life so you cause yourself less pain when reviewing your finances. You might force yourself to plan better for grocery store shopping expeditions so you don’t have to run back to the store. You might force yourself to wait a few days on Amazon purchases, in case something else pops up. You might check with daycare to see if you can pay once a month, instead of weekly. A natural outcome of simplification is experiencing a small amount of savings. Fewer trips to the grocery store each week means less opportunity for impulse buying. Delaying Amazon purchases might be enough to make you decide against that purchase all together. Some places offer price breaks if you pay in advance (insurance is one notable area that give breaks like this). Combining trips means savings on gas, plus less wear and tear on your vehicle. The first few weeks of tracking your spending will be the hardest, but have no fear! It will get easier, and the benefits of tracking your spending will outweigh any negatives. The sooner you get started, the sooner you’ll experience these benefits. Do you track your spending? Why or why not? Was it difficult for you to get started? How do you stay on top of your spending? I totally agree with all of your points. So many people underestimate how much they are really spending and where their money is going. I know it because I am guilty of it myself! After I had my son, I had to be more conscious about my spending and it was then when I started tracking my spending and it changed everything! I have been tracking my spending for 3 + years now, and I feel it is worth the time and effort. Basically I can save more, spend more, and budget better because of the tracking.